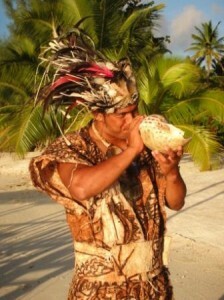 A traditional warrior blows a conch shell to welcome guests to his motu, Akitua. Turquoise water is the trademark of Aitutaki’s coral-filled lagoon where snorkelers and divers swim with giant clams and sea turtles. Soaking up the sun on Aitutaki's cerulean lagoon. Honeymoon Island is the perfect place to stroll champagne beaches and savor the quiet moments of life with a friend. An enthusiastic snorkeler leaps into the Aitutaki’s turquoise lagoon to search for tropical fish and, perhaps, pirate treasure. Auntie Nane serenades guests with her hand-carved ukulele at the highest point on Aitutaki.A traditional warrior blows a conch shell to welcome guests to his motu, Akitua. I’ve heard it said that you can pick your friends but not your family. A trip to Aitutaki in the South Pacific, however, challenged that old adage. When strangers welcomed me on my milestone birthday trip with hugs, kisses and eis – flower necklaces, I felt like I had arrived at a family reunion with distant cousins who were happy to see me again – even though we’d never met. 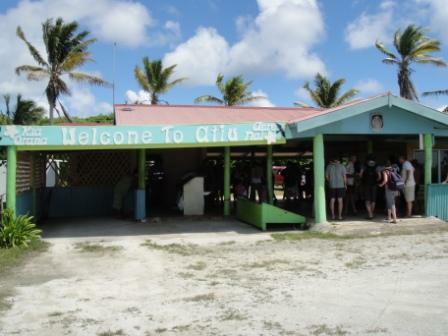 My freckled arms were immediately encircled by rich brown skin, and my frizzy auburn waves tangled in straight, dark hair as I was greeted by women who called out the local welcome, “Kia Orana,” and were soon clucking life advice to me. After dropping my bags in a beachside bungalow, I joined a group of travelers to spend a day snorkeling with a native guide in the crystalline blue lagoon that spans much of the island. 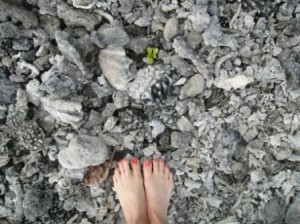 Fifteen tiny islets, or “motus,” ring the lagoon where giant clams and coral abound. TeKing George met us at the boat landing for a bit of instruction before we boarded his vessel, his deadpan style opposite to the ebullient nature of the women at the island’s small airport. A dozen travelers from around the world piled on TeKing’s boat. We talked and reached eager hands into the cool salt spray that flew around the bow of the boat as we motored to our first snorkel site. Once anchored, TeKing taught us tricks to attract curious butterfly fish, and one by one we leapt into the turquoise water, each of us armed with cameras and a healthy dose of enthusiasm. At least 50 butterfly fish immediately surrounded me when I submerged. They pecked at my mask and flitted between my arms and legs. I was a mermaid among the fishes, and I had to actively remember to keep breathing. The butterfly fish moved on to a new visitor, and I set off on my own to explore the coral that grew around me in ledges and bulbs. TeKing had explained that the coral’s flat tops were a result of their need to be submerged to live. If coral grows too close to the surface of the water or is exposed for too long during a storm or low tide, it will die. I followed brightly colored fish through passageways between the tables of coral and found star fish and octopi tucked into their crevices. After a break on the boat, TeKing took us across the lagoon where we focused not on the exotically shaped and colored coral surrounding us but on the giant clams that are native to this area of the world. Once in the water, he helped each of us wrap our arms around a heavy clam before guiding us on a snorkel tour to see them in their natural habitat. We could catch only a glimpse of the neon blue and green flesh that quickly sucked into their shell when they felt their surrounding water move. These clams had been over-harvested and are now in a protected area of the lagoon. Knowing we were a bit waterlogged, TeKing dropped his charges on the long, white beach of uninhabited Honeymoon Island where we walked and splashed in the gentle, lapping waves. It was impossible to think of anything from home; no worries were allowed on this small stretch of paradise. Lunch was grilled for us on Maina motu. TeKing and his assistant, Mai, grilled ahi and bananas and served them with fresh star fruit and mango salads whose chilled sweetness offset the warm and spicy entrees. An icy beer and a chat with TeKing finished the meal. He explained that he had lost everything and had been dying at the side of the road after a terrible accident only a year prior to our day together. After being flown to the mainland, Rarotonga, for emergency surgery, he was rebuilding his life again on Aitutaki one day at a time. His courage was an impressive example of the quiet strength I found in everyone I met on this island. His willingness to share his heartache moved us to a familial intimacy. We were not strangers with this man. A giant white turtle kept pace with us after lunch as we headed over to One Foot Island, another motu on the edge of the lagoon. TeKing took us for a walk and showed us how his ancestors had used the plants around him to make clothes and shelter. He pointed out where the Survivor series had spent a season, and he stamped our passports with the One Foot Island stamp – proof of our visit to paradise. Then he boated us through the quiet bay that had once been the Cook Islands International Airport before it had moved to a hard-surfaced field on the nation’s capital island, Rarotonga. By nightfall we were sundrenched and exhausted, and everyone on the boat was hungry for seafood again. After a quick shower, I slipped into dry clothes and headed out to dinner. It took a small launch to shuttle me across a bit of lagoon to Akita motu where an island warrior blew a conch shell in greeting. On the beach, I enjoyed fresh ika mata served in a coconut shell under a private gazebo while the sun set and tiki torches blazed. By the time my succulent panna cotta had been served, the stars were brightly twinkling. From here I saw the Southern Cross, the most prominent constellation in the Southern Hemisphere, and was captivated by constellations I could not name – or forget. Back at my beachside bungalow I curled up on my balcony to enjoy a tropical rainstorm and a glass of champagne. As the rain moved offshore, a full moon rose behind me and shone brightly at an ideal angle to create a moonbow across the South Pacific horizon. It appeared as a perfect white arc across the sky that beckoned me into a midnight dip in the dark and silent Aitutaki lagoon. After a sumptuous breakfast with freshly squeezed tropical juices blended from luscious fruits that exploded in my mouth, I headed out to explore Aitutaki’s terra firma. I enlisted an island tour and was greeted with another ei and a giant hug from my guide who insisted that I think of her as my new auntie. “You call me Auntie Nane!” she demanded. In the next few hours my new auntie showed me around the island and explained local customs. She showed me the ring of rocks where eight tribal chiefs would gather when important decisions were required. And near those rocks is the Visitors Rock upon which visitors who came to the island by boat long ago would first set foot. It was here that they would be welcomed to the island as family. She explained that on Aitutaki, there are no strangers. Any visitor is the responsibility of the tribe with whom they are staying. Even hotels and resorts follow the tradition which explained why I had been so openly embraced by everyone I’d met. Driving on a winding road, we stopped to pick some flowers. A local woman in the van named Misepa told us that she had to get up pretty early to pick enough wild flowers off of her bush to make a good ei before they were picked by her neighbors. In the Cook Islands the flowers and fruits belong to everyone. Individuals do not own property which means that everyone is responsible for and can enjoy every plant on the island. There are no arguments over lot lines or scoldings to children who pick the best star fruit, and there is a lot less daily stress. At the highest point of the island, Maunga Pu, Auntie Nane pulled over and grabbed a plate of passion fruit from a basket. She laughed when I asked for a utensil and taught me how it is meant to be eaten. 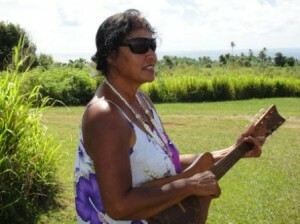 While the sweet juices dripped down my chin, Auntie Nane produced a hand-carved ukulele and began to sing. She sang to me about the frangipani flowers that hung around my neck and then joined her voice with Misepa’s in a language I couldn’t understand. The words were lost to me, but the sound of them captured the tropical sun, the luscious fruit and the endless deep blue ocean around us. Having learned that I was a former airline pilot, Auntie Nane insisted that I come to her house before she returned me to my resort. There I found the front half of an old DC3 that had been left by a movie crew several years before. Auntie Nane’s son, also a pilot, had convinced the crew to let them have the wreckage which now stood in a tangle of lush plants and rust to hold up one end of Auntie’s clothes line. Auntie Nane delivered me back to my resort but refused to say goodbye. She said she would see me again at the airport before I left the island. That is how family is treated on Aitutaki. As promised, she met me at the airport with her broad smile. She said that her nephew was going to be the pilot on my flight to Atiu, another of the beautiful Cook Islands, and insisted on introducing me to him when he arrived. We chatted as we waited for the plane to load, and then she wrapped me again in her strong brown arms. The hours we had spent touring her homeland had brought us close together, and she had given me important advice that eventually changed my life. But for that moment, she held me close, pouring her energy into me. “Next time you come to Aitutaki, you stay with your Auntie Nane,” she said with tears in her eyes. With inhabitants dating back over 1,000 years, the Cook Islands was protected by the British in the 1800s and spent the first 65 years of the 20th Century as a colony of New Zeland until it was granted self-governing status. It is now a democracy with a parliament that includes a representative from the hereditary island chiefs and a representative for those Cook Islanders who live in New Zealand and Australia. The head of state remains Queen Elizabeth II, as the Queen of New Zealand where Cook Islanders are granted automatic citizenship. Aitutaki is part of the Cook Islands nation that is located just south of the equator and east of the international dateline and is comprised of 15 islands that are spread over a maritime area of over a million square miles. There is only one direct flight from the United States to the Cook Islands each week on Sunday night for a return the following Saturday night. The Air New Zealand overnight flights provide a refreshed arrival in both countries and cost around $1000. 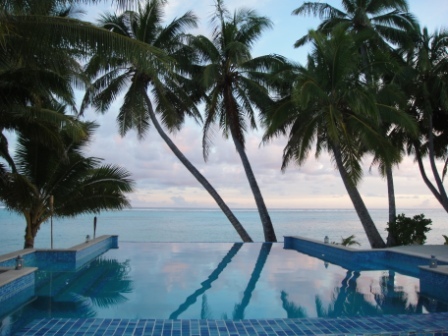 After enjoying the capital island of Rarotonga, book a flight on Air Rarotonga to Aitutaki. This round-trip flight over the azure South Pacific will cost about $300. With no high-rise hotels anywhere in the Cook Islands, travelers find familial intimacy at smaller resorts. The Pacific Resort on Aitutaki(www.pacificaitutaki.com) offers beachside bungalows that boast privacy and an open view of the water. Aitutaki Lagoon Resort and Spa (www.aitutakilagoonresort.com) exists on its own motu (islet) and offers over-water bungalows in addition to beach bungalows. The island is only about 10 sq mi, so some exploring can be done on foot, but the best way to find your way around the island is to book a tour when you arrive with Nane & Chloe’s Tropical Tours (www.cookislands.travel.com). 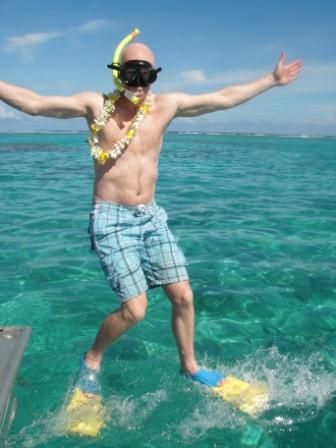 There are several tour operators who offer dive and snorkel trips in Aitutaki’s lagoon. 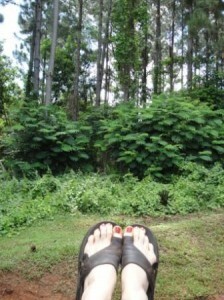 To learn more about having your passport stamped at One Foot Island during a day with TeKing, go to www.teking.co.ck. Most resorts offer restaurants that have delicious local seafood and produce and will provide picnic hampers for days spent on the beach, and day trips on the lagoon include lunch. To explore other local restaurants, ask hotel staff for recommendations. Toes in the tropical jungle of Atiu. 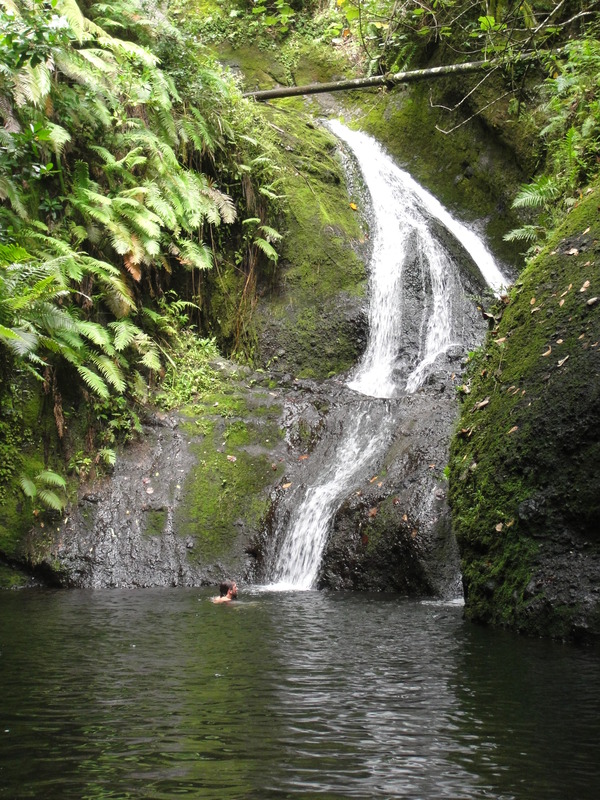 I had just bushwhacked through a dense jungle on an ancient coral reef and crawled into a dimly lit cave behind a silent Polynesian guide named Paul Kura on the tiny island of Atiu in the southern Cook Islands. When he wordlessly gestured toward a shallow pool of water in the bottom of the cave, I was a bit confused as to what was on offer. But when he stripped off his clothes and dove down into that pool, I got the idea. The depth had been deceiving. 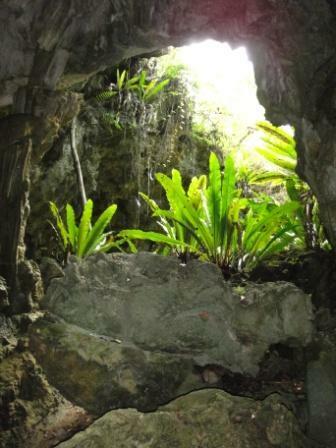 This was no tiny cave-puddle, this was an underground oasis – a place to cool off after our sweaty trek. I admit to a moment’s hesitation after I had peeled down to my mud-smeared skivvies and was teetering on a cliff of damp limestone, but I’d come halfway around the planet to challenge my boundaries in honor of a significant birthday, and I wasn’t going to let this opportunity pass me by. I closed my eyes and jumped. After splashing about for a while in the refreshing water, I found a little nook in the cave where I could rest on a submerged ledge with my upper body leaning against rough stone. The clear water stilled around me, and I could sense the explosive history that had created this volcanic island – how far it was from my busy city life. In the dark quiet, a long black shape slowly curled around my legs and then drifted away from me. No one else saw it, and I began to wonder if I had imagined some kind of mystic cave creature. Four other brave explorers played with us in the water cave, which I learned was on Kura’s family’s land and rarely visited by outsiders. We were lucky to have been introduced to him by the owner of our resort, Roger Malcom. An atmospheric physicist and 31-year resident of the island, Malcom knew how to help his guests find the adventure of a lifetime. He even turned a minor emergency into an education when he whisked us down one of the island’s five roads to the local hospital, a small building next to a raised plot of land. While we waited for one of our group to be bandaged up after a fall on the jungle’s sharp coral floor, Roger pointed to what is now the doctor’s residence atop the elevated property. Oddly enough, when the missionaries came, they built a hospital on that sacred spot. Locals were so conditioned to its purpose that they only brought dead and dying people to the hospital, not people who could be healed. Eventually, respect for local custom, the missionaries moved the hospital to a plot of land nearby and made the building on the raised area into doctors’ quarters. Local custom is deeply rooted in Atiu. Once our injured member had been safely bandaged, Malcom invited his guests to participate in a centuries-old tradition called a tumunu. We ducked back into the edge of the jungle and approached a rustic shack on which was crudely painted “Rising Sun Boys.” From within wafted the smell of mosquito coils, sweat and fermented fruit. 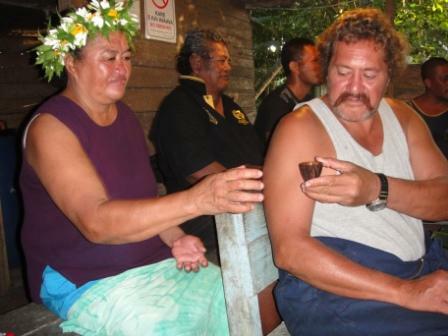 We respectfully slipped onto wooden benches within the small shed and waited quietly to be introduced to Daniel Tearaitoa, the boss of this tumunu. Malcom had already explained the expectation of tumunu guests to us, so we each knew to wait patiently for the barman in the middle of the room to dip a small coconut shell into a bucket between his knees. He slowly scooped out a local brew and handed it to each of us in turn so that we could take it with one hand, gulp it in one drink and then hand the shell back. While we ritually shared the communal coconut shell cup of jungle brew, Kura and Kau Henry sang, played guitar and talked to us. They told me that my mystic cave creature had been a vaiakaruru, a freshwater eel, come to honor me. After a few local songs, they struck up some tunes that their foreign guests might know. We loosened our inhibitions with every round of sweet fermented fruit juice – the recipe for which is not shared with outsiders. A South African visitor repeatedly raised his shell in toasts to peace, health, love, life, happiness and well-being. He said that he had learned this 8,000-year-old toastmastering, or tamada, tradition in Eurasian Georgia, and that at the end of the toast we should all join him in a Buddhist chant. So we did – all of us. And the cup kept passing. A few rounds later, we were people from seven countries with arms entwined singing “Que Sera, Sera” at the top of our lungs. That was when the barmaster’s shell tapped his jug, and the group fell silent. Henry explained that this was the serious time in the evening when he would pray for us. Then we were each expected to introduce ourselves and share a few words. Some people simply said what country they had come from or what they did for work. Others shared what impact the Cook Islands were having on them. I found myself unable to speak for a moment when I tried to explain how welcomed I had been by everyone on this island of 400 people and that I had never so openly and intimately experienced a joining of so many cultures. When the Rising Sun Boys – including the boss’s wife, Vaine Tearaitoa – introduced themselves, they were equally solemn in their shared comments and gratitude for our congregation. After the serious ritual, the singing and stories resumed. A young woman from Los Angeles grabbed a guitar and belted out the blues with her long brown hair swirling to the beat. Beside her, Polynesian men clapped, flower-adorned Tearaitoa pounded a drum, and our international summit continued long into the night. Getting there: From the Midwest, the trick is to get the direct Air New Zealand flight from Los Angeles to the main island of Rarotonga that runs every Sunday night for a return the following Saturday night. These overnight flights allow for a refreshed arrival in either country, but the connection to Los Angeles can be hard to find online. Be creative; it’s worth the effort. The total cost of these flights will be less than $2,000. 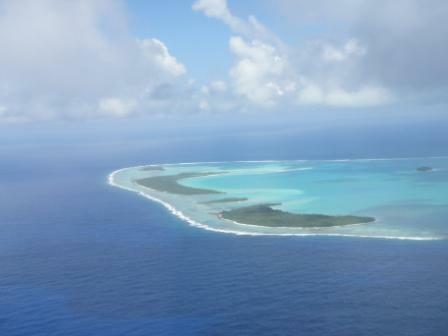 After a day or two in Raro, hop a flight on Air Rarotonga to Atiu. This round-trip flight over the tropical blue South Pacific will cost about $300. Staying on Atiu: Roger and Kura Malcom offer air-conditioned jungle cottages that sleep up to five people for about $200/night. Their property boasts a pool and grass tennis court that is perfect for late-night star-gazing. Book online to find discounts at www.atiuvillas.com. Other accommodations are available with Marshall Humphreys (www.atiutoursaccommodation.com) and with Auntie Nga and Papa Paiere at Taparere Lodge (www.atiutourism.com) for less than $100/night. Where to eat: Kura Malcom is a fantastic cook and welcoming hostess who serves dinner and drinks nightly. Do NOT leave Atiu without trying her delicious Pota, a taro leaf/coconut cream concoction that captures the sweet flavor of the island. In addition to Kura’s Kitchen, you can grab a burger and a snack at Super Brown Burgers, and all accommodations provide self-cooking areas. Tours and activities: Your hosts will likely welcome you as family and help plan your activities, but to see what’s available, go to www.atiutourism.com. You won’t find your tumunu there, though. For that, you’ll have to live like a local and ask around when you arrive.